This ministry is the fruit of the labor of the first Lutheran settlers in the 1640s in the then Dutch colony of New Amsterdam (now New York) on the island of Manhattan in response to the love of God and embracing the truth of the Gospel of Jesus Christ. 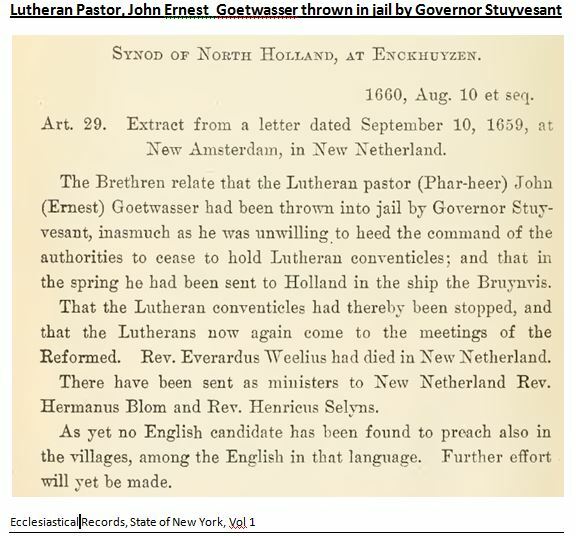 While the exact date of the founding of the congregation is unknown, the earliest records in the archives in the Lutheran Church in Holland indicate that in 1648 the Congregation of the Unaltered Augsburg Confession of Faith on the Island of Manhattan sent a delegation to the mother church in Holland asking for a minister to serve the small band of Lutherans, notwithstanding the fact that they were denied the right to worship openly and freely under Dutch rule. The first minister arrived in 1657, but he was warned not to conduct worship services or to carry out his pastoral duties. He was subsequently jailed and deported back to Holland in 1659. When the British took control of the colony in September 1664 and renamed it New York, the first British governor, Richard Nicolls, at the request of the Lutherans, issued the historic Charter on December 6, 1664, the congregation’s legal start date, thus giving the full rights previously denied them to express their religious beliefs in maintaining their Lutheran identity and practice. This seminal moment took place almost one hundred and fifty years after the Reformation (1517). St Matthew congregation has been a church on the move, dictated by circumstances. After its first building was destroyed in 1673, two years after it was built on the very spot where Trinity Episcopal Church now stands at the bottom of Manhattan, the congregation was given a deed for land south of Rector Street and Broadway. 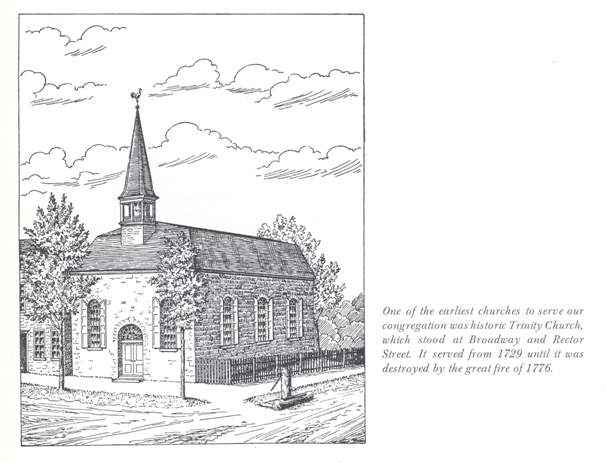 In 1729, a new building named Trinity Church was erected. The congregation worshipped there until the sanctuary was razed by fire during the Revolutionary War in 1776. And so journey of giving witness to the love of God continued at various other locations on the Island of Manhattan. In 1750, eight years after his arrival from Germany to serve the church in Pennsylvania, Henry Melchoir Muhlenburg, “patriarch” of Lutheranism in America, was called to serve the Lutheran congregation in New York. This was perhaps the most difficult time in the history of the congregation when there was much wrangling over which language, Dutch or German, was to be used for worship. 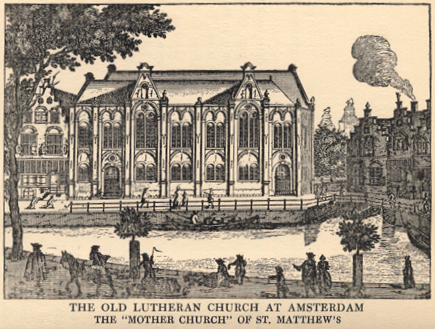 Consequently, Christ Church, a German congregation was formed, leaving the mother congregation, Trinity Church, were services were conducted in the Dutch language. 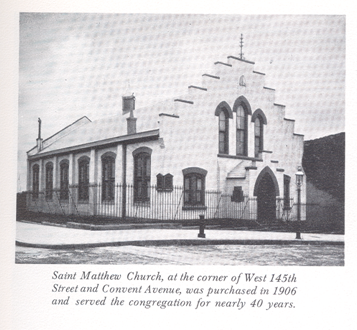 In 1752, St Matthew started its parish school which served its members well. At its Broome Street building, in 1881, Concordia College, Bronxville, NY, formerly Concordia Collegiate Institute of the Missouri Synod, was housed at its founding. St Matthew covered most of the expenses of the Collegiate Institute’s operation until it moved in 1893 to Hawthorne, NY. At this time St. Matthew was making plans to move again – to the Harlem neighborhood. St. Matthew was one of the founding member congregations of the New York Ministerium in 1786, under the pastorate of the Rev. Dr. John Christopher Kunze (son-in-law of H.M. Muhlenberg), who also was the first president of the Ministerium. Pastor Kunze, with the help of his assistant, George Strebeck issued a Prayer Book and the first Lutheran Hymnal to be compiled in America in 1795. Being the most conservative of Lutheran churches in the east, St Matthew left the New York Ministerium in 1885 and joined the Evangelical Lutheran Synod of Missouri, Ohio, and other States, now the Lutheran Church – Missouri Synod (LCMS). 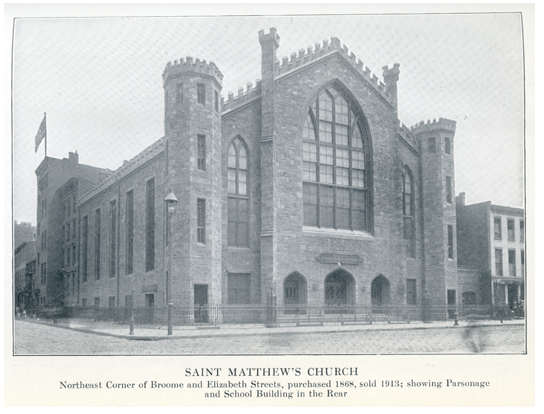 From its Broome Street location, in 1906, St. Matthew started an “uptown” mission at 145th Street and Convent Avenue, where a new chapel was erected. This became the permanent place of worship for the congregation in 1913, following the closure of the Broome Street location. 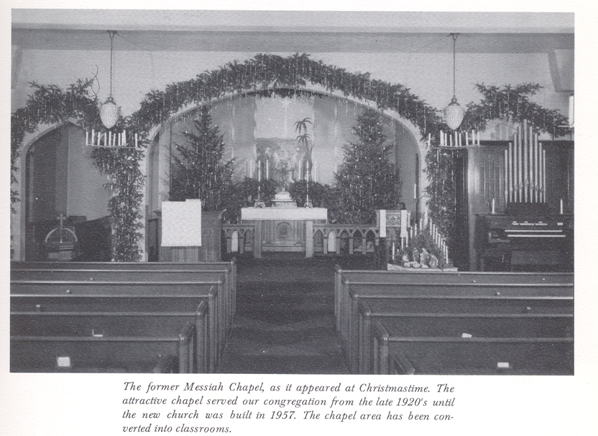 In 1945, St. Matthew again moved. After two years of talks, the congregation merged with the Messiah Mission Church in the upper Manhattan neighborhood of Inwood. 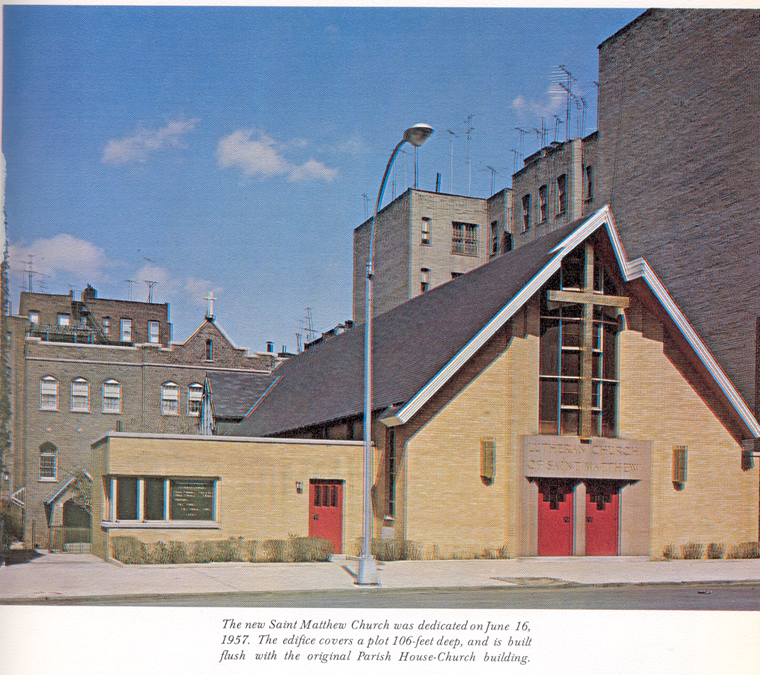 A decade later, on Thanksgiving Day, 1956, excited parishioners and their pastor, the Reverend Alfred Trinklein laid the cornerstone for a new sanctuary at 202 Sherman Avenue. This beautiful sanctuary served God’s people of 50 years as the house of bread in its ministry to the people of God and the wider community. There in Inwood, more than 250 low-income and needy households received groceries monthly; Alcoholic Anonymous groups gathered for more than 25 years in carrying out their programs to the addicted and their families; and the School ministry, the first Christian School in Manhattan provided a safe environment for quality education. At the end of June, 2006 another chapter in the long history of St. Matthew came to an end. It became necessary for the congregation to move yet one more time. Unfortunately, the school ministry ended one year earlier, at the close of the 2004-2005 school year. But the faith journey continues. The dedicated members and friends of America’s oldest existing Lutheran congregation began worshiping on the first Sunday in July, 2006 at The Cornerstone Center, a building belonging to the ELCA congregation of Our Saviour’s Atonement (OSA), 178 Bennett Ave, one mile south of the Sherman Avenue location. St. Matthew’s move from place to place on the island of Manhattan since it beginnings in the mid-1600s is a reminder to us that the Church of Christ “is not a building…the church is the people,” and that we, the people of God are the temple of the Holy Spirit, where he dwells in temples not made with hands. But at the same time we surely would like to once again have a sanctuary that we can call our own in continuing the sacred ministry of Word and Sacrament that was commissioned by Christ Jesus to the apostles and the Church, which was brought to the new world by the first settlers and kept alive by the many generations of faithful people of God, both clergy and laity, whose faith in Jesus Christ never wavered in the midst of uncertainty and adversity, through the power of the Holy Spirit. 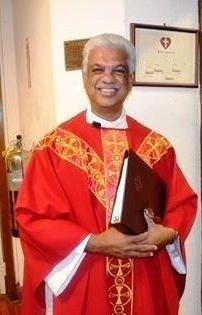 St. Matthew’s pastor is the Rev. Peter Deebrah. A Might Fortress is Our God; a bulwark never failing. Soli Deo Gloria! St. Matthew worships on Sundays at 1:30 p.m. For more information, please call our office at 212-567-5948.